Android AIO Driver is a small tool that contains one stop solution of all drivers for Android Devices. It contains All in One Drivers including Android ADB Driver, SPD Driver, MTK Driver and Samsung Driver. Android ADB (android debug bridge) driver allows almost every android device to connect to the computer without installing any further PC Suite applications. SPD Driver allows you to connect your Spreadtrum Devices to the computer (you will need this while flashing the stock firmware or flashing the IMEI on the device). MTK Driver allows you to connect your Mediatek Devices to the computer including MT65XX, MT6592 and others. You may require this while flashing the stock firmware and IMEI on your mediatek Device. It also features MTK preloader drivers that includes Android CDC and VCOM Drivers (the only drivers which supports flashing stock firmware on dead/power off devices). It allows you to connect your Samsung Device to the Computer without the need of installing Samsung Kies software on the Computer, which also consumes system memory by running in the background. [*] Installer Package: Android AIO is a installer package, which means you have to install it first on the computer then after you will be able to use it. [*] Alternatives: We have already shared lots of USB Drivers in our Driver Section, including Driver for Mediatek Devices, Samsung Driver, HTC Driver, Sony Driver, Universal ADB installer and lots more. [*] 15 Seconds ADB Driver: This is one of the best ADB Driver package that also supports almost all android devices. You can Download it from here. 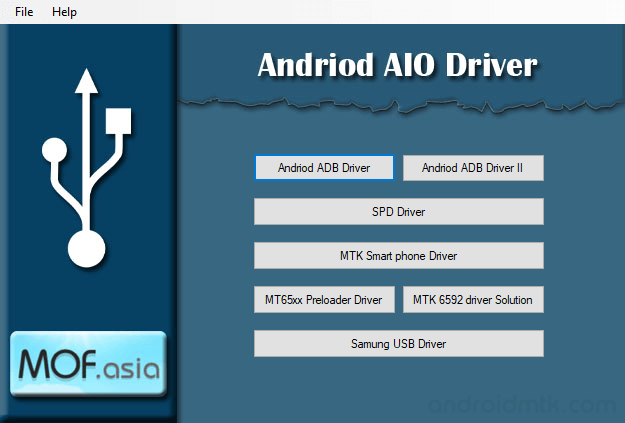 [*] Credits: Android AIO Driver is created and distributed by Mof.asia. So, full credits goes to them for sharing the driver package for free.